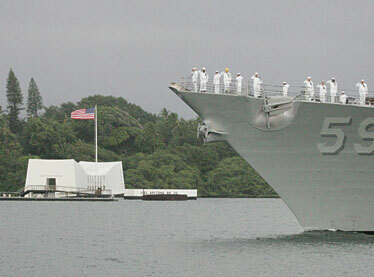 The USS Russell passes abeam of the Arizona Memorial. Crewmembers on the destroyer have started a blog about the ship's activities. The Pearl Harbor-based guided-missile destroyer USS Russell has started a blog to keep its families informed about its activities since it left Pearl Harbor on March 24 to join the USS Abraham Lincoln strike group. Postings cover a wide variety of topics and events, ranging from a gun exercise to sailors fishing off the side of the ship. It has recorded more than 9,000 visitors. Subjects include the less than glamorous aspects of shipboard life, such as trash duty, as well as exercises involving hunting for a submarine. "Anti-submarine warfare is probably the most challenging mission a ship or strike group can perform, especially when done well. It involves nearly every asset and tactic you can imagine, as ships and aircraft perform a thorough and sustained search by listening with passive sensors and probing with active sensors, both electromagnetic and acoustic," writes Lt. Cmdr. Chris van Avery, Russell's executive officer, who created the blog. Families of the ship's crew also appreciate the blog, which operates on self-imposed "standing orders," making sure to keep news and ship's events unclassified and also maintaining a strict level of operational security about the ship's daily operations, the Navy said. "This is the first time that I have ever seen anything like this," said Russell ombudsman Joni Nowatzki. "It's a great forum for families to get a better understanding of the sailors' life at sea." To access the blog, visit destroyermen.blogspot.com. The submarine USS Bowfin will celebrate its 65th birthday on May 1 at a 2:30 p.m. ceremony at Pearl Harbor's Bowfin Park. The submarine was launched at the Portsmouth Navy Yard on Dec. 7, 1942, one year after the attack on Pearl Harbor. Fighting out of Australia for its first five patrols, the sub was the first and one of only two American submarines to carry an admiral on a war patrol. On its sixth patrol, the Bowfin sank a pier, a crane, and a bus. The Bowfin completed nine patrols, and had left Pearl Harbor for its 10th patrol when the war ended. The Bowfin served as a training vessel until 1971. A 300-pound granite plaque will be dedicated at 10 a.m. May 5 at the trailhead of the Aiea Loop to honor the crew of a World War II Air Transport Command B-24J Liberator that crashed into the Puu Uau Ridge after taking off from Hickam Field. Ten Army Corps aviators died in the crash.